Iranian Foreign Minister Mohammad Javad Zarif will attend multilateral talks on finding a political solution to the conflict in Syria in Vienna this week, a government spokeswoman has said. It will be the first time Iran - an ally of President Bashar al-Assad - has attended such a summit with the US. Representatives of Russia, Saudi Arabia and Turkey will also attend the talks. Earlier, the US said an invitation had been extended to Iran - a move Syria's Western-backed opposition questioned. Meanwhile, Russia said its aircraft had struck 118 "terrorist" targets in Syria over a 24-hour period - a new record - as a result of what its defence ministry said was new intelligence. The main round of talks on Syria is expected to take place on Friday, but diplomats say some preparatory meetings could happen on Thursday evening. Aside from inviting Iran to attend the talks in Vienna, the US has also said it could live with a political transition in Syria that would leave Mr Assad temporarily in power, potentially removing an obstacle to building international consensus. For some time, Iran has been pushing a four-point plan for Syria that calls for a ceasefire, followed by the formation of a national unity government, constitutional reforms and, finally, free elections. The plan could now, conceivably, be used as a basis for further discussions. But perhaps more surprising than the change in US policy, has been Saudi Arabia's acquiescence to Iran's involvement in the talks in Vienna. Many in the region see the rivalry between Iran and Saudi Arabia as being at the heart of the deepening conflicts in the Middle East. And, in addition to potentially ending the destructive and bloody war in Syria, the talks in Vienna might therefore offer a way to calm that rivalry. "We have reviewed the invitation, and it was decided that the foreign minister would attend the talks," Iranian foreign ministry spokeswoman Marzieh Afkham said. Egypt and Iraq also confirmed they had accepted invitations to the meeting. BBC diplomatic correspondent James Robbins says that while the US is certainly not welcoming Iran to the Syria talks, it will now tolerate Tehran's involvement. 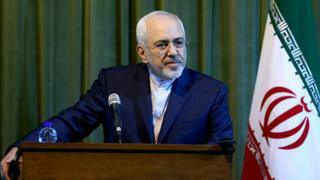 Iran's Fars news agency said Mr Zarif had discussed participation in the Vienna talks with Russian Foreign Minister Sergei Lavrov by phone on Tuesday. Kremlin spokesman Dmitry Peskov later told reporters that Russia wanted a "widening of the dialogue" on Syria. Both Iran and Russia - another ally of President Assad - have recently stepped up their military role in the Syrian conflict. Iran has long acknowledged sending military advisers to Syria, but has denied the presence of any ground forces. Despite that, unconfirmed reports earlier this month said that hundreds of Iranian troops had arrived in Syria. Russia and Iran have insisted that Mr Assad must be part of any transition government and that the Syrian people must be allowed to decide who governs them. The US has indicated it could only tolerate President Assad during a short transition period, after which he should step down.